Software Cinema: 中央氣象局什時會整合 Google Earth ? 長久以來中央氣象局都只有提供俯瞰的衛星雲圖, 但是 Abstraction Level 太高, 也沒辦法任意變更 Granularity, 說穿了只是往往在颱風來時, 只是看到台灣整個被淹沒而已, 沒辦法調整 Granularity 來看自己居住地區的最近幾小時情況. 雖然也有提供即時影像, 但是一來都是定點, 同時一下子又把視野調到太小, 參考度其實也不高. 我相信中央氣象局手上握有的資料一定比利用衛星雲圖給一般民眾看到的更多, 只是受限於經費以及技術限制, 沒辦法在網頁上提供更先進, 更詳細且好用的 Visualization 介面給訪客. 既然如此, 是否中央氣象局應該考慮採用整合既有的技術, 例如 Google Earth, 作為平台, 附加屬於中央氣象局的有用資訊呢 ? 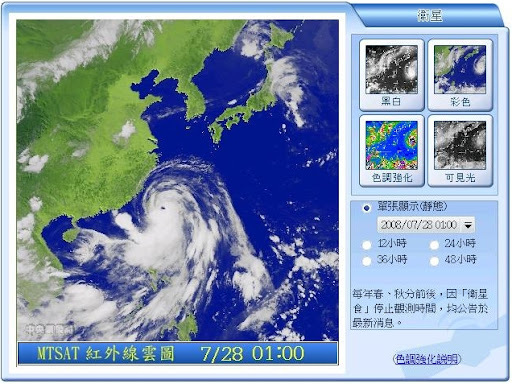 目前 Google Earth 已經可以讓使用者即時觀察颱風以及颶風等天氣狀態, 並且上面可以看到許多有用的天氣資訊, 如果中央氣象局可以讓資訊部門成立一個小組負責把中文化的資訊整合上去, 我相信只有初期會花比較多心力, 之後就會很輕鬆. This entry was posted on 上午7:00 and is filed under context-aware , visualization , web engineering . You can follow any responses to this entry through the RSS 2.0 feed. You can leave a response, or trackback from your own site. 問題是, 專業的氣象資訊與呈現和一般民眾生活的關聯是什麼. 衛星雲圖, 颱風路徑預測圖, 累積雨量表, etc. 這些訊息在風災來的時候並沒有太大意義阿. 至少到目前為止看了這麼多專業的氣象表演, 還沒有覺得有任何意義的傳達 (都是 data interpretation 而已). 另外就是, 台灣的氣象觀測點能夠提供多精細的 granularity 呢? 我在這邊看到的氣象資訊呈現的確比較 fancy, 內容也較豐富, 但是不見得比較 detail. 再來就是國家政策了. 記得之前在思考 GIS 曾經發現過, 在台灣, 地理相關的資訊並無法讓民眾自由取得 (國防機密阿...), 因此, 氣象資訊會否也是同樣的情況? 因為我找不到我想要的, 只好找個看起來像的來充數 ^^b 我想要的是類似 Google Map / Google Earth 可以很容易的調整觀看地區的 granularity, 甚至是角度, 而隨著不同的 granularity, 提供的氣象資訊也會不同. 不過我沒有想到資訊提供的問題...不知道在 Smart Home 中被提到的一些簡單的戶外雨量風力偵測 Device 的成本會不會很高, 否則可以考慮在群聚地周圍一定範圍建立 Weather Sensor Network ?